This tour was designed for those visitors who arrive in our quaint village on a tour bus. Tour buses park at the corner of Junipero and Ocean, behind the Carmel Plaza. Tour bus drivers usually give their passengers one hour to enjoy Carmel on their own. It is truly impossible to see Carmel in one hour but if that is all you have this tour is for you. This walking tour is meant as an overview providing a variety of options, don't expect to see them all in one hour. I have listed a number of suggested stops from cafes, to shopping, charming courtyards, to art galleries, and wine bars. Many other businesses that you will pass, I have listed by name and linked to a web site if available. Window Shopping Ocean Avenue will hopefully leave you with a good impression of our town and encourage you to come back another time and stay longer. Begin your tour by crossing Ocean Avenue. You will be avoiding the "tour bus traffic" by heading down the north side of Ocean toward the beach. Look for the big green area, this is Devendorf Park named after the Father of Carmel-by-the-Sea, James Franklin Devendof. Besides a bust of Frank, we have memorial monuments to those who have paid the highest price for our freedom from World War II, Korea, and Vietnam. the statue of another important figure of our community, Saint Junipero Serra. At the southwest corner of Devendof park is one of the largest trees in the Village, a Coast Live Oak. From this edge of the park, cross Mission Street to Palomas Home Furnishing. This stucco and tile building began its life in 1932 as Graft's Carmel Dairy. The original dairy sign is painted to the right of the front door. Well almost the original. In 1933 the sign was damaged when a driver lost control and ran into the side of the building. Above the door notice the iron light fixture which is really original to the dairy. Earl Graft ran the dairy for 27 years. Next, this prime corner spot was the ever popular, as well as aromatic location of the Mediterranean Market for over 48 years. Today it is Palomas Home Furnishing, a store filled with one of a kind hand crafted products such as hand blown glass to reclaimed teak furniture. The owners of Palomas are also happy to create a piece to match your specific needs. Just ask. When you see Mona Lisa looking down at you from her coffee cup you are at Cafe Carmel Coffee House. before continuing down Ocean Avenue. Continue to the end of the block past Pamplemousse Women's Boutique, Mark Areias Jewlers, Augustina's Clothier , and the Coach "outlet." 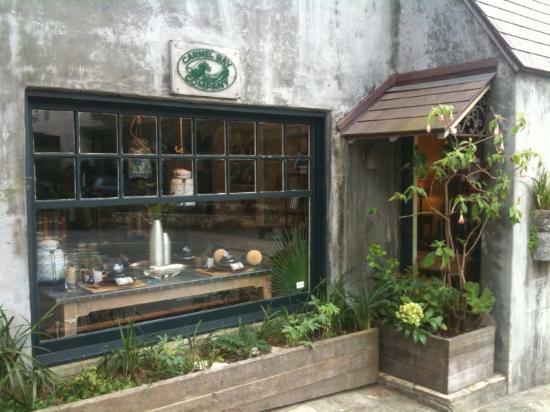 In the next block pass Coast Carmel and Galerie Rue Toulouse to the Carmel Drug Store located under the green awning. Carmel Drug Store is located in the Poeble-Leidig Building which was built in 1907 to house the stores of Carmel's central business district. In the middle of the block the Palace Drug Store opened, complete with marquee lighting. In 1910 the Palace became the Carmel Drug Store. Fifteen years later Carmel passed an ordinance restricting the size and style of all store front signs. For some reason the Carmel Drug Store sign was left along with the marquee above. This is the only neon light in Carmel-by-the-Sea. Look up, it is still there. Not lit of course. If you are in need of any odds and ends, toiletries, postcards, or over the counter remedies, The Carmel Drug Store never lets me down. One day I needed white out for a project. Not willing to get in the car and drive to CVS, I walked down to the drug store and they had exactly what I needed. I like to say that between Bruno's and Carmel Drug Store, Safeway is redundant, kind of. But with no time to waste, we continue - past, and Sotheby's to Whittakers of Carmel. Whittakers features local artists, lots of dog needle point pillows, French linens and Carmel quaint whimsical paintings and posters by Willa Aylain. Continue down this block pass Fine Art Turkish Gallery to Carmel Classics. This historic building was built in 1939 as the Bank of Carmel, the outside of this building features two bas-reliefs by Paul Whitman. Look both ways then cross Dolores. Actually pay attention whenever you cross the street here. I try and make eye contact with the drivers of the cars and smile. The business in front of you is Alain Pinel Realtors. Built in 1905, this structure served as Carmel's first official City Hall. The flag pole is a replica of the original erected on June 6, 1917. Make your way down this block past Jim Miller Art Gallery, Tamara G Fine Art, Pangaea Grill, and the Harrison Memorial Library (don't you wish you had more than one hour? - please come back we have so much to offer). The Harrison Memorial Library was designed and built by M. J. Murphy in 1926. If you want to see the Daffodils and Freesia in bloom, come visit in March - and thank Carmel Garden Club! At the corner of Ocean and Lincoln check your time on the Rolex clock outside Fourtane Estate Jewelry. As you cross the street you are heading to your right mid block toward the Pine Inn wrought iron arch. The iron work of this arch was done by John Hudson a local blacksmith in 1975. His wife Monica is an author, historian and local tour guide. To the right of the arch is Preferred Properties and Windy Oaks Wine Room. Enter the Pine Inn Courtyard and Passageway. and you will arrive at the Pine Inn Gazebo. 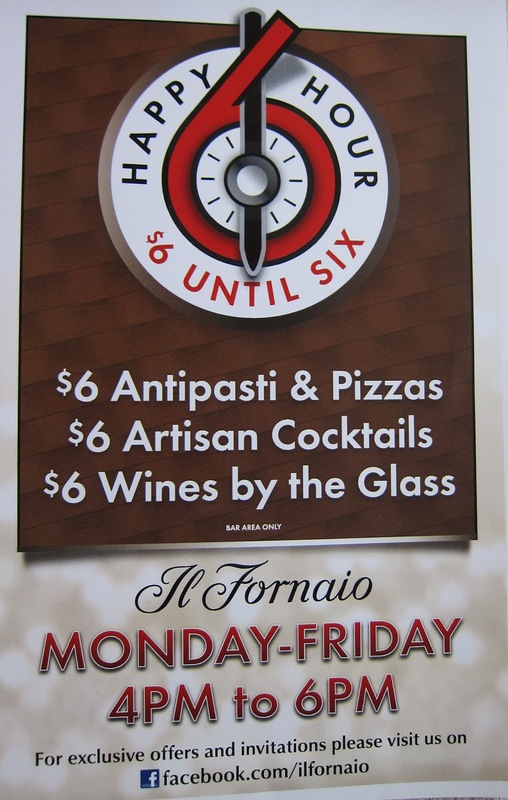 The sign outside will say Il Fornaio. Inside the Gazebo, which was added to the Pine Inn in 1973 by former owner Carroll McKee, is Il Fornaio Panetteria a bakery and deli serving, among other things, coffee, panini and pizza. Guests of the hotel and locals gather daily at the large round table in front of the fireplace. The Pine Inn was originally built on the corner of Ocean and Broadway (now Junipero) in 1889 as the Hotel Carmelo. Owners, Devendorf and Powers, decided to bring their hotel guests closer to the ocean, so they placed the hotel on pine logs pulled by mules and moved it to its present location at Ocean and Monte Verde in 1903. Things were simpler then. After the Hotel Carmelo was moved in 1903, M. J. Murphy was hired to enlarge the hotel and add a sun room in the south west corner. On July 4, 1903 the hotel reopened as the Pine Inn. The sun room is now part of Il Fornaio, a cozy room that offers great sunset views. No time to cook, if you happen to drop by between 4 and 6PM Monday through Friday check out their Happy Hour. Walk back through the restaurant toward the gazebo and make a right through the door after the bar area. of the Pine Inn Hotel. The current owners, Richard and Mimi Gunner, working with their decorator, Max Davis from Honolulu, have brought back an elegant feel of years gone by. But there is no time to sit and day dream, we still have the other side of Ocean Avenue to explore. 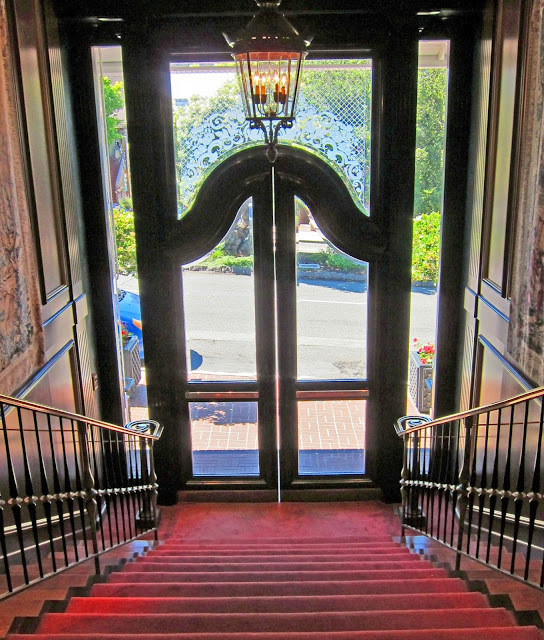 the wide red carpeted stairway. Turn right (south toward the ocean) then turn left at the corner of Monte Verde and cross Ocean Avenue toward the two story building of clinker brick and stucco with half timbering and a blue gabled roof. This building was built in 1924 for Dr. Amelia L. Gates, a pediatrician, as a retirement investment property. Pass this brick building and walk down the east side of Monte Verde under the Casa de Carmel Inn sign. Next door is Carmel City Hall. This building began life as All Saints Church. But that was not the beginning of All Saints Church. Church services were first held in the Bathhouse (this no longer exists) at the foot of Ocean Avenue then moved in 1907 to the basement of the Pine Inn. In 1911 church services were moved to the stage of the Forest Theater on Mountain View and Santa Rita. In 1912 services were moved to Miss Tilton's studio at San Carlos and Sixth. Until finally in 1912, Frank Devendorf came to the rescue of these wandering church services and offered this lot on Monte Verde between Ocean and Seventh for a permanent church building. All Saints Church designed by San Francisco architect, Albert Cauldwell and built by Carmel's very own M. J. Murphy was completed in 1913. Outgrowing this location, the church moved to their present location southwest corner of Dolores and Ninth in the 1940's. 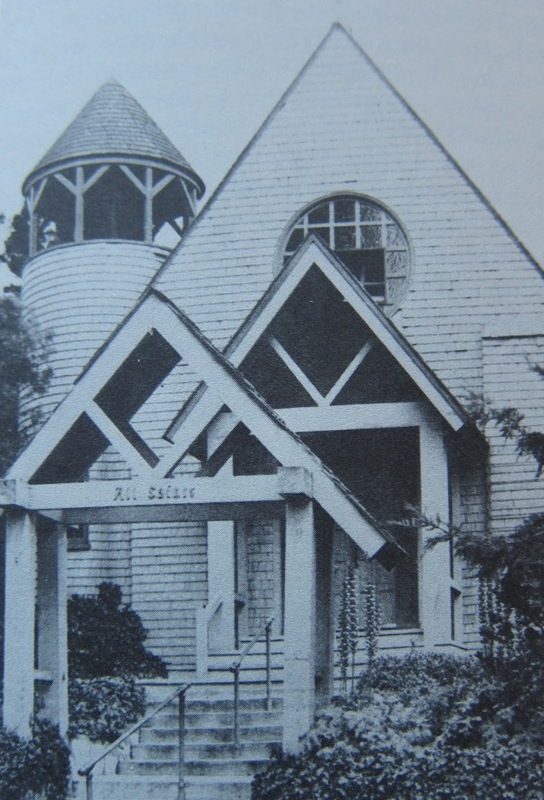 In 1946 All Saints Church on Lincoln was sold to the City of Carmel to be used as their City Hall. Walk back toward Ocean Avenue on Monte Verde and turn right into the parking lot of the Casa de Carmel Inn. This is the Monte Verde Street entrance to the historic Court of the Golden Bough. to enter the lower courtyard of what used to be The Golden Bough Theater. Currently this courtyard will filled with shopping and a wonderful Italian restaurant Il Tegamino. Il Tagamino has a tiny indoor presence, the tables shown below are set when the weather cooperates for outdoor dining - your dog of course is welcome. The Golden Bough Theater came about because a man by the name of Edward Kuster (at the suggestion of his first wife Una Jeffers) left a successful law practice in Los Angeles and moved to Carmel in 1919. In the early 1920's he decided to open an experimental theater and professional drama school in the Village. He hired Lee Gottfried who had built his home on Carmel Point (a mere two blocks from his ex-wife Una's) to build the theater. The Golden Bough opened in 1924 with rows of wicker chairs as seating. During a production of By Candlelight on May 19, 1935 the neat rows of wicker chairs became kindling for the fire that destroyed the theater. Arson was suspected but never proved. In 1941 Kuster opened another Golden Bough Theater (this time at its present location on Monte Verde between Eighth and Ninth). On May 21, 1949 during a performance of By Candlelight, the theater burned down again. This time overhead lighting was blamed. to the set of stairs. Climb the stairs and walk through the archway in between, to the upper courtyard where you will find a historical placard that explains more of the history of the Golden Bough. also constructed by Lee Gottfried. The Carmel Weaver Studio began life in 1922 on the southeast corner of Ocean and Dolores and in July of 1923 it was rolled on logs a block and a half down Ocean to its present location where as well as being the Weavers Studio, it "moonlighted" as the ticket booth for the Golden Bough Theater. Today the box office window for the theater sits at the back of the Cottage of Sweets which has been selling yum yums since 1959. When Edward Kuster planned his theater he envisioned it surrounded by small shops with a medieval European style. Kuster commissioned M. J. Murphy to build the cute pastel pink building with mini turrets in 1923 that today is the home of Venofye Skin Care. Walking east up Ocean (toward the Bus stop) you will pass the eastern border of the Court of the Golden Bough. This building built for Kuster by Lee Gottfried in 1925 today is the home of the restaurant Porta Bella. southwest corner of Lincoln and Ocean Avenue. you will always find a line out the door waiting for tables. Because of the popularity of their first restaurant, business partners Faisal Nimri and Bashar Sneeh took over two long time restaurants on Ocean Avenue, Merlot Bistro and PortaBella. Both have undergone renovations and reopened. Merlot Bistro is now the aforementioned Mediterranean and PortaBella which has retained its name. 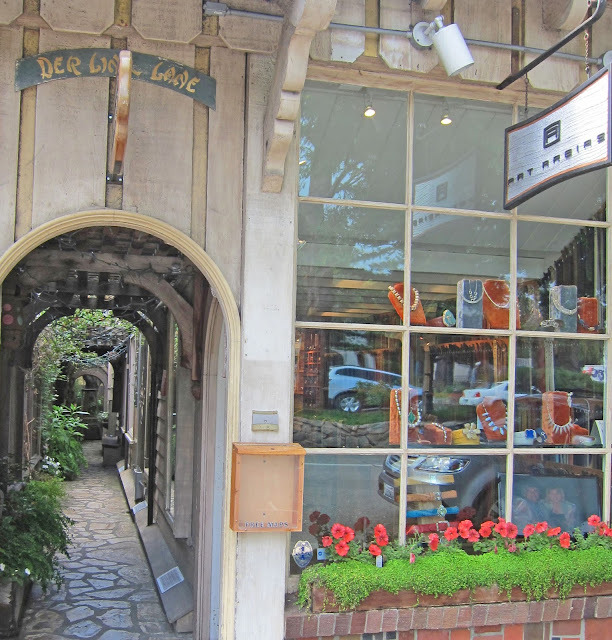 Pass Carmel Bakery Coffee Co., Pat Areiars and then turn right in the middle of the block to enter Der Ling Lane, it will be under the Thomas Kinkade Garden Gallery sign. This is another one of our "secret" passageways. During the winter months when the sun sets early, the twinkle lights add a magical glow to the archway. Pass B & G Jewelers, where you will find high quality jewelry - they also do custom work and repairs. Pat Areiars and B & G Jewelers share the store that was originally named Der Ling, hence the name of the alley Der Ling Lane. Der Ling was owned by Hallie and Adolf Lafrenz who decided on the name after a buying trip to Peking in 1920 where they met Chinese Princes Der Ling. At the end of the alley is the inner courtyard with a cute English style cottage. The artist Thomas Kinkade was so enamored by this cottage that it became the subject of his sold out collectors piece "Studio in a Garden." Today this is the Thomas Kinkade Studio in the Garden. Galante Vineyard Tasting Room. At Galante Tasting Room you may taste about six different varietals which are grown on Jack Galante's Ranch in Carmel Valley. By the way, Jack's great grandfather was Frank Devendof, of Devendorf Park fame. home of the famous Blue Dog. The Blue Dog, is Tiffany, artist George Rodrigue's companion for 12 years. Tiffany is now attempting to reunite herself with George through the Blue Dog. She turns up all over town. The patio of Rodrigue Gallery opens onto Piccadilly Courtyard where you will find a public restroom. Exit Piccadilly Courtyard at Dolores Street. Look to your right across the street and find the fairy tale style building with the red and white striped awning. This is The Tuck Box. Constructed by Hugh Comstock in 1927, it was first used as a restaurant in the early 1930’s by the name of Sally’s. In the early 1940’s two sisters from England opened a small tea room in the building, which they named The Tuck Box. Hugh Comstock built a cluster of 11 fairy tale style homes in the Comstock Historical Hill District of Carmel. From the Tuck Box head north toward Ocean Avenue. This short half block has three wine tasting rooms! Scratch Wines is inside the Winfield Gallery, and Trio Carmel (wine and olive oil) is next door to Lan de luz Linens, where you can have beautiful linens machine embroidered, and finally Caraccioli Cellars. Most wine rooms do not open to 1 or 2PM. At the corner of Dolores and Ocean, turn right. The Bus Stop is three blocks away. But there is still a lot to see. Pass Paloosh which carries Laundy, BCBG, Juicy Couture, Nicole Miller, Lacoste and more. And while I am name dropping, next is Lloyd's Shoes which carries, Anyi Lu, Eric Michael, FSNY, Jeffrey Campbell, Rebecca Minkoff, Sam Edelman and more. Between the two signs that say, The Club (which carries designer clothing) is an archway which leads into the Las Tiendas building. Built in 1929, the stairway, tile and grill work are all original. Keep going past the Carmel Coffee House just a wee bit further to Robin Winfield's Gallery. She is a long time Carmel resident and creates stunning contemporary art. Back out on Ocean between Kris Kringle of Carmel, where it is Christmas 365 days of the year and A W Shucks Cocktail and Oyster Bar is the Doud Arcade. An arcade is a covered passageway with shops on both sides. Which is exactly what you will find here, 12 shops, 2 restaurants, and an ATM machine (near the entrance to the right). Need to check your time? There is a large clock on the wall opposite Wicks and Wax. Amelia's, and Robin's Jewelry. 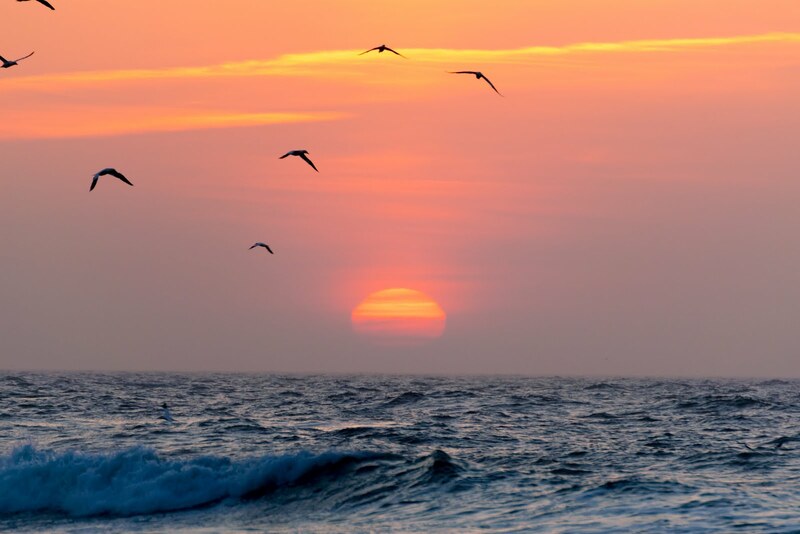 Another reason why you need to come back to Carmel, there is just so much to see. And you haven't even left Ocean Avenue. Anyway, at the end of the arcade is Carmel Belle. This IS your last opportunity for a cup of coffee or snack before running for the bus. Exit Doud Arcade at San Carlos, turn left up the street toward Ocean, past Sanctuary Vacation Rentals, and Keller Williams Realty. At the corner is Laub's Country Store the last place to purchase something that says Carmel. Cross San Carlos to Carrigg's Of Carmel. and is worth a walk through if time permits. From Carrigg's you will pass Bittner Fine Pens and Paper, Adam Fox, Romanoos Fine Jewelry, and cross Mission to the Carmel Plaza in front of Tiffany and Co.
Continue to the end of the block past the statue and fountain to where your bus is waiting. At least we hope it is still waiting. Thank you for visiting! Until next time, Happy Adventures! 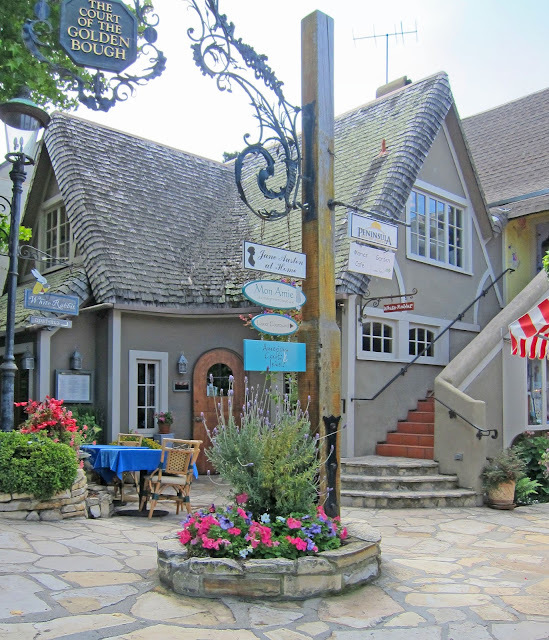 For an interactive map of Carmel walking tours please visit GPSmyCity here. Black and White Photo of Carmel Dairy - Monica Hudson, Images of America Carmel by the Sea, Arcadia Press, 2006, p. 47. Photo from Pat Sippel Collection. Black and White Photo All Saints Church on Monte Verde between Ocean and Seventh, Sharon Lee Hale, A Tribute To Yesterday, (Valley Publishers 1980) p 63, Photo by George Cain. 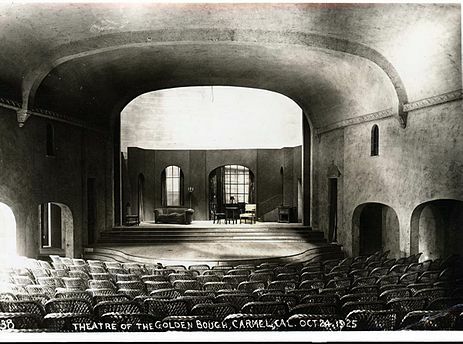 Black and White Photo of inside of Golden Bough Theater 1925 from Pacific Repertory Theater files. 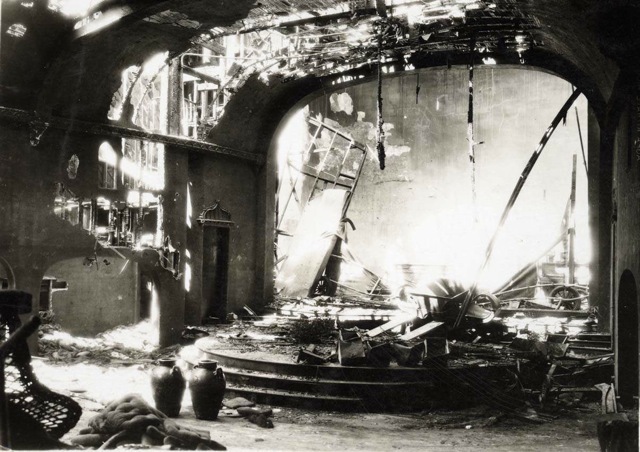 Black and White Photo of inside Golden Bough Theater after fire in 1935 from Pacific Repertory Theater files. Black and White Photo of the Carmel Weavers Studio and Golden Bough Ticket Booth from 1923 from Pacific Repertory Theater files. 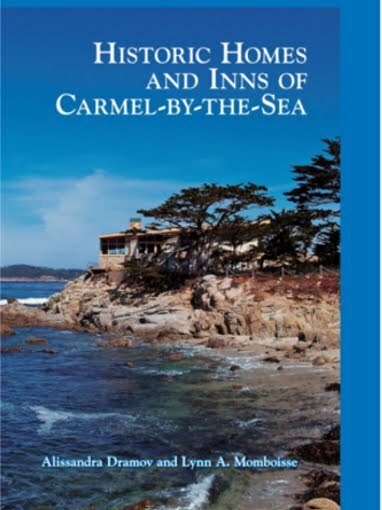 Our new book on the Historic Homes and Inns of Carmel-by-the-Sea is now out! Purchase at Amazon on Kindle!! $9.99 - - Contains Google Map on acknowledgement page showing where all historic homes are located! Follows us on Social Media! (c) 2016 LA Momboisse. All text, pictures and videos are the exclusive property of LA Momboisse. Powered by Blogger.